This story originally aired on NPR/WGCU. Some teenagers in Immokalee want to end the cycle of poverty in their town with salsa. Nearly half the people in the farmworker community are poor. So a group of high school kids are capitalizing on the areaâ€™s agricultural background with â€œTaste of Immokalee,” a salsa and hot sauce company that donates its profits to local people in need. Last year, the students sold about $20,000 worth of produce. And theyâ€™re already close to doubling that this year. On a Saturday morning, Donachy Blanc and two other students tried to make a sale at Wynnâ€™s Market in Naples. They each wore red t-shirts with the words â€œTaste of Immokaleeâ€ written in white. Blanc told their company story to passing customers. 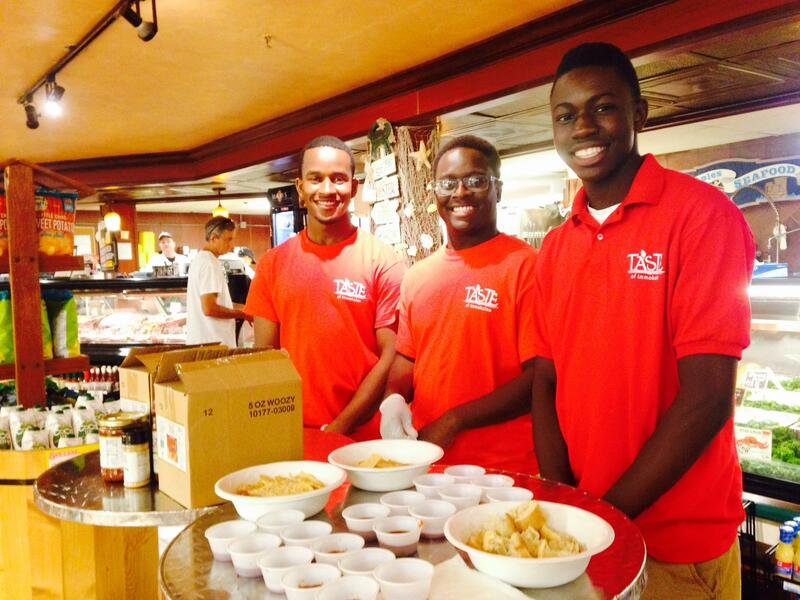 “A group of us Immokalee high school students, we created this business just to give back to the community,” Blanc told customer John Flaherty, who used tortilla chips to test three different flavors. Blanc helped create the business about two years ago when he was in high school. Now, heâ€™s just completed his freshman year at Florida State University on the pre-med track. Blanc is a paid intern for the business this summer, focusing on inventory. And he successfully pitched the product to Flaherty, who grabbed a salsa jar. â€œTaste of Immokaleeâ€ products are on the shelves of multiple stores in Collier County, including nearly 20 Publix Supermarkets. Their products range from tomato and jalapeno salsa, to chipotle barbecue sauce. This began with a local mentoring organization called 1-by-1 Leadership Foundation that got funding for a youth entrepreneurship program. It then reached out to Immokalee High School students. “We started it in a little room and we just started brainstorming and pitching our ideas,” said Regine Francois, another student founder. Sheâ€™s now studying business management at Columbia University in New York. Francois said when they were told the product should give back to their community, they immediately thought about their farmworker parents. The students used homegrown produce to test multiple recipes. But the salsas and sauces are not made with local goods right now because the nearest packaging company is in Sarasota. The goal is to one day afford to bring a co-packer to Immokalee. And that could help boost the local economy. Francois said she and some of her other classmates received college scholarships from â€œTaste of Immokaleeâ€ proceeds. She says sheâ€™s excited for the new students who join every year. “I really hope that they see this company as an inspiration that they’re gonna be able to do great things too,” she said. Some weekends, the company’s executive director and lead mentor Marie Capita meets with the high schoolers to talk shop at the 1-by-1 Leadership offices. She said the ultimate goal is to give students real life experience and leadership skills for their future jobs– no matter what those turn out to be. One teen newcomer dreams of owning a bakery, another wants to run her own dental practice, and Myra Jaimez said she wants to be a marine biologist. She said she’s definitely going to leave Immokalee someday but she said she will come back. “Help out, probably leave again, discover new things, come back tell the community, go back. You know, just that learning experience. Itâ€™s just as you get older, you learn more and more things. You just never stop learning,” said Jaimez. For now, the students are working on new recipes that theyâ€™re not willing to disclose yet.